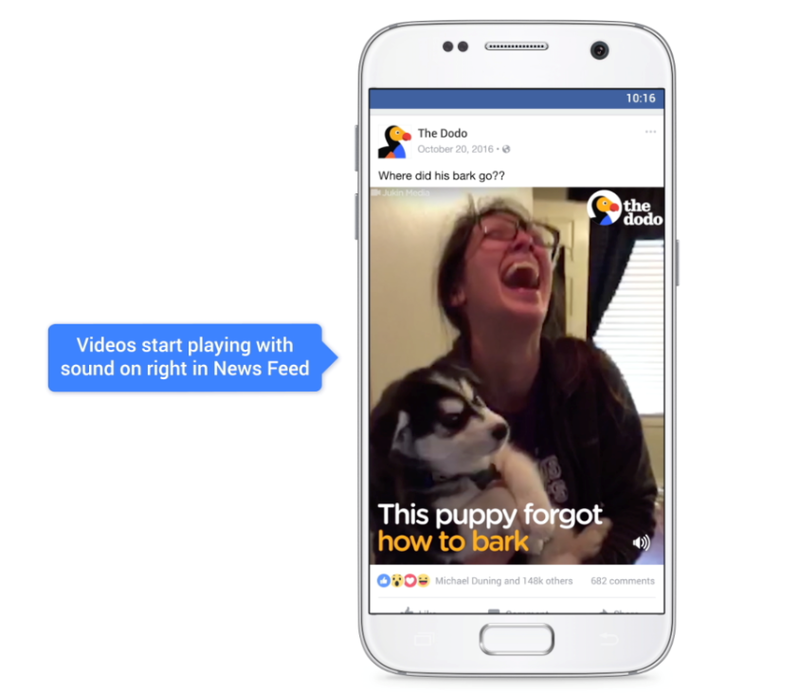 Last February, Facebook published a research report which showed that Facebook users prefer videos in their feed to autoplay with sound off. "In mobile-feed environments, people prefer having the choice to opt in to sound. Our research found that when feed-based mobile video ads play loudly when people aren't expecting it, 80% react negatively, both toward the platform and the advertiser. Advertisers should take this into account when creating video ads, making sure their stories don't require sound to communicate their message." That's pretty definitive - 80% of people react negatively. "Videos in News Feed have previously played silently - you tap on a video to hear sound. As people watch more video on phones, they've come to expect sound when the volume on their device is turned on. After testing sound on in News Feed and hearing positive feedback, we're slowly bringing it to more people." That's right, Facebook videos will soon autoplay with sound be default. So what could have changed so much in a year? It's hard to say - as per the above quote, Facebook says that people have "come to expect sound", and it's possible that that expectation has been heightened by Snapchat. "We believe that audio is a fundamental component of video, especially when it comes to emotion and impact. Creating and watching Snaps with sound is a more engaging and expressive experience than if the Snaps were muted. Just imagine watching a horror movie without a soundtrack-it might look like a comedy. That's why we play Snap Ads with sound, unless a user has muted their device. On average, over 60% of all Snap Ads are watched with sound on." It's likely that Facebook has taken this as another way to hit back at Snapchat. But 80%. Seems like a risk. Facebook does note that if your phone is set to silent videos won't play with sound, and that users can always disable the feature by switching off "Videos in News Feed Start with Sound" in their settings - so there are options. But as noted, it's quite a turnaround from their previous approach. The announcement comes as part of a larger video options announcement, which includes improved vertical video presentation (another shot at Snapchat), the ability to keep watching a video as you scroll through Facebook and a new and improved TV app.